When I got married, I was given a copy of the family cookbook from my husband’s family – with all kinds of relatives contributing their favorites. This is my version of a recipe I discovered in that collection. It’s an easy recipe to be creative with. Try using different cheese combinations, switching out the spaghetti noodles for another kind of pasta, or adding your favorite pizza toppings in place of the pepperoni. I’ve also made this with brown rice pasta to make it gluten-free. It just depends on what you like – and what you have on hand. Since I started having my children take turns planning and helping me make dinner on Friday evenings, Spaghizza shows up quite regularly at our dinner table on Friday night. If you’re looking for a new recipe that’s made from staple ingredients, is simple to make, and picky-eater-appealing… here you go! Cook the spaghetti noodles according to the package directions until al dente. Rinse immediately in cold water until cool and drain well. In a medium-size bowl, whisk eggs and milk. Add parmesan cheese and seasonings. Toss in spaghetti noodles and transfer to a greased 9×13 pan (you can also use 2 8×8 pans, if you want to freeze one for later). Pour the spaghetti sauce on top of noodles. Top with approximately half of the pepperoni. 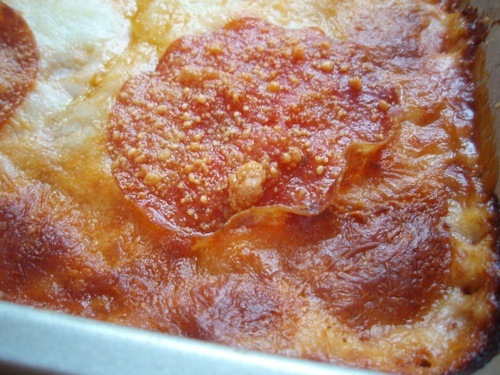 Sprinkle the shredded cheese on top of the pepperoni and top with remaining pepperoni. Sprinkle with additional parmesan cheese if desired. Bake at 375 for 25-30 minutes, until golden brown. Let stand 5 minutes before cutting. Is it almost like a lasagna? It looks great. This is really cool! I’ll have to try it. My son would get a kick out of this. It would be really good with pizza sauce instead of spaghetti sauce I bet! Yes, we call it Baked Spaghetti, and my mom calls it Pizza-topped Spaghetti. This recipe is different than what I do, though, so I may try it one night for something a bit different. This looks really good. Thanks for sharing it! I’d love to freeze some of these for after baby’s arrival, so, do I need to bake them first, or just assemble and freeze? Thanks! Just assemble and freeze. 🙂 I do it all the time! You don’t need to bake them – just assemble and freeze! This would be a great recipe to “sneak” some veggies into. Shredded zucchini could be mixed in with the spaghetti with very little change to taste or texture. You can also make it with spaghetti squash! It’s not a very frugal meal that way, but a great way to eat tons of healthy vegetables without even really realizing it! It is sooooooo good with spaghetti squash. Heather, I love this idea and definitely will try it! Also may use sizzled turkey ham in place of pepperoni, along with pineapple… Hawaiian Sphaghizza! I wish my family liked spaghetti squash as much as I do (or just liked it period!). The pictures inspire me. It looks yummy! I’ve gotta try this. I’ve read it a couple times and it sounds great…but when do you add the milk/egg mixture? After you whisk the eggs/milk/parm cheese/seasonings together, you ” toss in” the spaghetti noodles to that same bowl/mixture. Then you transfer this entire bowl into the 9×13 pan. Hopefully that makes sense. Sorry to be confusing! 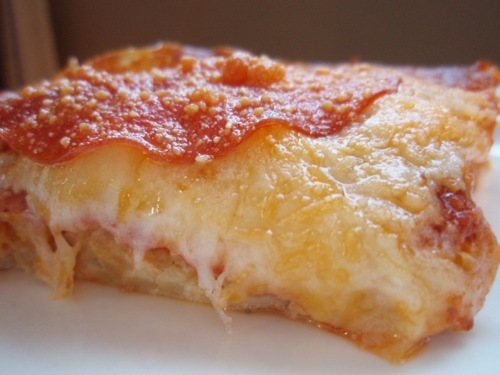 This is very similar to an old family recipe that we have, we just use macaroni and pizza sauce instead = Macaroni Pizza! Yep – you can definitely change up the pasta for variety! Enjoyed this recipe. Thanks for sharing. I love easy meals with ingredients I had most of. Just pulled it out of the oven and it smells so good! I think with my oven this would have been done at 20 minutes. I didn’t check/pulled it out at 24 minutes, and it is crispy brown (but still looks yummy:)). Thanks so much for the recipe! Three helpings is awesome! 🙂 My kids love it, too. Made this for dinner tonight, it was great, the whole family loved it! Will be making this again! YUM! I made this tonight and loved it! It’s going into my cookbook. Many thanks! My family loved this! I will make it again but next time I will probably add a little more seasoning and some salt to the egg mixture. Great looking recipe! I wanted to make something like this with my friend, but is it imperative that we mix the spaghetti with the eggs? What will happen if we do not use eggs? This recipe was awesome. Really easy and lasagna but not as heavy, the egg gives you the ricotta texture. So easy for substitutions too! Had extra rigatoni and penne so subbed that. Used a little too much pasta so added an extra egg and a touch more milk. The only suggestion I would make is to slice up the pepperoni into halves or smaller pieces so it’s easier to cut through. So good! I just came across this recipe in my pins. How far ahead of time could I make this? I am wanting to put it together tonight, bake tomorrow. Also how would you go about freezing it? How long and what temp should I use once it’s frozen? OOH MY gash! this was sooo delicious!!!! Where do you place the eggs and milk? Trying to figure that out.